Hackerspace Adelaide | A place to hack together projects, software & hardware. Air-Stream Wireless, Fab Lab Adelaide, Hackerspace Adelaide, SA Makers and Smart City Studio launched Adelaide’s first Internet of Things (IoT) Hackathon on Friday night 22nd April 2016. 22nd April 6:30pm, launching Adelaide’s first Internet of Things (IoT) Hackathon. More picture of the event on our facebook page – click here. Competitors were grouped into 3 teams where they spent the day developing their ideas using the #WorldCreateDay #Hackaday theme “Making something the Matters” on the 23rd April 2016. Make the council bins in the Adelaide City smart in order to encourage recycling, track waste and let the disadvantaged track down valuables. Local people are able to post bulletins, for sales, events, whatever is happening in their neighbourhood. Users access the system using a handheld app choosing to initiate face recognition, bluetooth id or wifi mac and geolocation identification methods. Each team member received a Raspberry Pi each with the Win10 IoT Core from Microsoft. Xiaogang Dong (Norm), was the winner of the Hackerspace Adelaide team play award from Team 1. Chosen for fitting in with a room of strangers, working closely in a team with others and good problem-solving skills to help his team. The Hackerspace Adelaide team play award includes a $100, 12month membership of Hackerspace Adelaide and a hand made Hackerspace Adelaide T-Shirt. Shawn Zeppel, Systems Engineer at PACT IT & Committee Air-Stream Wireless who produced and coordinated the live stream. Fee Plumley, Technoevangelist at Reallybigroadtrip who conducted some wounderful interviews and hosted our live stream broadcast. The aim of this event was to promote the importance of the maker community, and the need to establish an Adelaide Makerspace. If a small event like this can be organised over a few weeks, where a dozen people in a room can create three very unique ideas for building something that matters, what then could a full-time Makerspace achieved with a city of makers and artists. If we truly want an innovative and a creative community that inspires people to pursue further education, the arts, or create new ventures in Adelaide we need to get local people together making new and interesting things. Imagine if there was an Adelaide Makerspace with specialist equipment, tools and space for makers and artists from across Adelaide could go any time of the day or week to create and collaborate with others. City Of Adelaide | Fab Lab Adelaide | GrapeBrain | Hakerspace Adelaide Inc. Some regular Hackerspace attendees had great success at Unleashed / Govhack this year, being presented with their awards on Sunday. Robyn, Kylie and Damien won the “Renew Adelaide Creative Space” award with their Talking Heads project, scoring the space some assistance from Renew Adelaide. They also scored an honourable mention in the “Best Artistic Use of Open Data” category and won the Space a new Printrbot Simple, courtesy of Bilby CNC and Govhack! Get building everyone, before we have 3 non-functional 3D printers! Congratulations to Tamsyn for winning the Spirit of MOD Unleashed, for her assistance at the Machinery Of Data workshops. Also Tobias, Daniel and Damien got the Coder’s Choice award for their Revive Survive application. The easiest way to control a Crazyflie nano quadcopter is with a laptop and a PS3 controller (or similar), but tonight we played around trying to control it using the Android client. Took a bit of messing around, so here’s how we got it working. Open Android Studio. Click File > Import project. Search for “Set channel 107” and change 107 to your channel number. Good luck controlling it.. it’s a bit slower to respond than running it on a laptop/bluetooth, but hopefully that’ll change as they update the Android app. On the weekend of the 20th/21st of April Hackerspace Adelaide hosted the local site of the NASA SpaceApps Challenge. The idea of the weekend is to explore the data that NASA collect from their satellites, rovers and probes, and try and use it in a way that makes it easier for us to connect with. Unsurprisingly, Hackerspace regulars were peppered through three teams that formed from the attendees. After being recently inspired by Mark‘s Project Horus balloon launches, our team (Steven Pickles, Jamie Mackenzie, Steven Clark & Simon Loffler) initially started work on a disposable emergency balloon that could be launched in times of fire, flood, plane crash or natural disaster and return image and position data to aid in search and recovery efforts. Unfortunately, with the help of Jamie’s brain full of geometric equations, we quickly calculated that an affordable solution that delivered useful data in a timely fashion just wasn’t feasible. A few despondent looks later, it was back to the challenge page for some more inspiration. 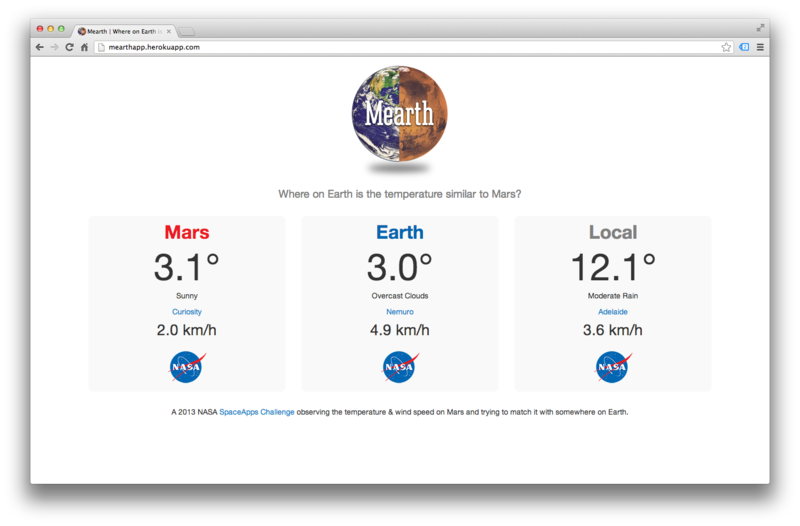 Having watched and rather enjoyed the livestream of the Curiosity Mars rover’s descent to the surface of the red planet, I floated the idea of using some of the rover’s temperature data in the Wish You Were Here challenge. Looking into the actual readings I quite surprised to see that the temperatures ranged from around -70C to 7C. My colour/image oriented brain assumed that a red planet meant a hot planet, how wrong it was! The next question we asked was if there was anywhere on Earth that had a similar climate, and with that Mearth was born. Pix jumped into action parsing the XML feeds from the rover (in the end we used another group’s JSON feed) and wrote a script to pick the closest matching city on Earth from a list of 500 possible candidates. I bootstrapped a Ruby on Rails app, pushed it to Github (for collaboration) and then onto Heroku (a cloud service for the app). A few hours and pizza/beer/coffee later, and we had a prototype. The last requirement of the challenge was to create a video describing our project. At the end of the day, our group and one of the other Adelaide groups Moon Settler were selected as two of the four from Australia to go into the International round of voting. As you can probably tell, we had an awesome time at the weekend and can highly recommend participating in it next year. Special thanks go to the Adelaide organiser Sumen Rai for such a well managed weekend, and also Nicole Bromley for volunteering her time setting up / bringing us coffee and pizza and generally being lovely and smiley. If you like the sound of this event, perhaps you should sign up to participate in the GovHack weekend coming up – a chance to mash government data into useful visualisations and web apps: uladl.com (don’t ask why it’s called unleashed). Pix drawing some temperature data to the screen. The black lines are Earth’s maximum and minimum temperatures, the red lines are Mars’ maximum and minimum temperatures. The Adelaide SpaceApps challenge team. It was an awesome day!! The organisers are saying anywhere between two thousand and four thousand people attended. linux .conf.au this year was in Canberra and those from Hackerspace who went along had a great time. The first two days are made up of mini conferences or miniconfs. Robyn Willison was the chief organiser of the Haecksen miniconf. Fee Plumley’s great talk at the Haecksen miniconf was on Open Source Cities. One of the stand out talks for me was Denise Paolucci’s Overcoming Imposter Syndrome. Denise isn’t a Hackerspace person I just want to highlight her excellent talk. Her slides are up on Slide Share and you can download the video from the LCA mirror. Pix gave a talk at the Blue Hackers BOF which unfortunately I wasn’t able to attend because I was at the Interactive Textiles BOF. If anyone has a photo could they please let me know so that I can include it in this post. Wednesday, Thursday and Friday are the main conference days. All the conference videos are available for download so if you didn’t make it this year you can still listen to some great talks. Mark Jessop giving his talk on high altitude ballooning. Andrew Tridgell aka Tridge talking about UAVs. Launching a UAV at the local oval. People took turns flying it. Sorry if I’ve left anyone out, or forgotten to mention important stuff. If anyone has photos they would like included or more info leave a comment and I’ll include it in the post.